I was asked to provide comment on the Prime Minister’s visit to Myanmar. In the course of looking at articles and background reports, I found myself feeling a bit annoyed at the PM. "What are you doing in Myanmar? Didn't you just get off the plane in Russia and Saudi Arabia?" This set me to thinking that it is not just Abe's foreign travel that is excessive – it is his EVERYTHING that is excessive. Half of the 30 minute-long 7 p.m. NHK news broadcasts seems composed of "Prime Minister Abe did this...and Prime Minister Abe did that...and the Prime Minister also did this...and in a surprise, Prime Minister Abe did something yet again..."
I accepted that the most likely explanation for my feelings of being beset by news of Abe's activities came from being "one of the fiercest critics of the reborn Abe regime" (Michael Penn's characterization, not my own - Link). However, I suspected there was substance to my annoyance – that Abe's near omnipresence was more than just a notion buzzing around in my head. So I decided to do a little bit of counting. The data set is the accounts of the PM's activities posted on the Prime Minister's Residence website under Sori no ichi nichi (literally "The Prime Minister's Day" but translated into on the website as "The Prime Minister in Action" ). 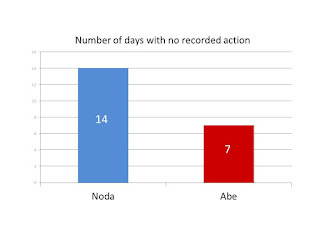 What gets reported through Sori no ichi nichi is not everything the PM did during the day. Instead only the activities the prime minister's support staff and the ministries think we should hear about receive write-ups. As such, Sori no ichi nichi is a picture of the prime minister's day not as it is but as his subordinates want us to see it – which is, in a media-drenched modern post-industrial democracy, probably more important. Rather than actual achievement what is important is presence, at least as far as the molding of perceptions of the prime minister's interest in his work. So what happens when you look at the prime minister's calendar as his people want us to see it? And how does Abe in this second term compare to his predecessors in terms of doing visible business? Looking at the graph, it sure looks as though there is more red than blue. 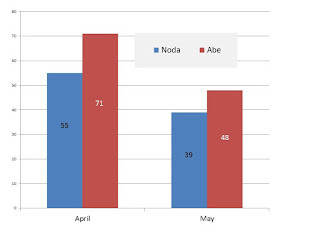 The number of Noda postings only clearly exceeds those for Abe once in late May – the time when Noda was hosting a summit of Pacific island nations. 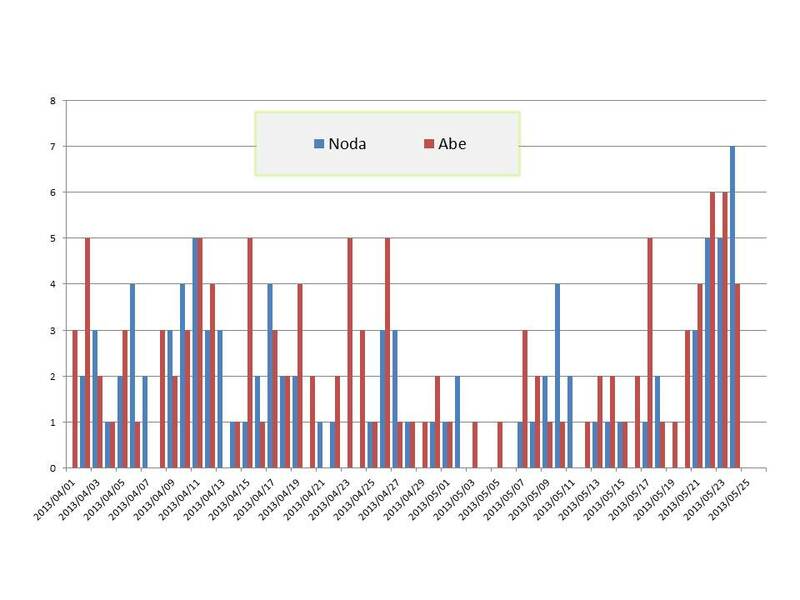 Looking at the monthly totals, we see that indeed for at least the two months, Abe's posts outnumber Noda's, with Noda's numbers in May getting goosed by the slew of posts showing Noda holding the hands of heads of state from countries that are dots in the middle of the ocean. There might be only one posting on some days – but that one post goes a long way to maintaining an illusion of diligence. However, it is in state visits and foreign travel the differences in between Abe's and Noda's administrations seems most stark. 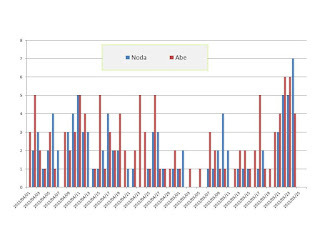 Here, by contrast, is the overseas travel of Prime Minister Abe during the same span( January 1 to May 24) this year. OK to be fair, the time spans are perhaps not commensurate in terms of their situation within each PM's term in office. A better record than Jan-May 2012 but still not comparable to Abe's record of gregariousness. Looking at both lists for Noda, we find his use foreign travel was rote. After his first five months in office, his only travels were second visits to South Korea, China and the U.S.A. -- and these only to attend multilateral forums. Noda did not use foreign travel, as Abe is doing, to as a means of resetting both the political and media agendas. Was Noda a prisoner of political gridlock and the ongoing recovery from 3/11? Or was his lack of overseas travel a signal that his perception of the office of prime minister was consuming him?